Instagram is pushing an update to its Android and iOS apps today, one which introduces one of the image-sharing service’s most requested features of all time – caption editing. The update also includes new discovery sections that are broken up between photos and potentially interesting people you might want to follow. With caption editing, you can effectively go back and erase the typo posted alongside your image moments ago that is driving you a little nuts. Screwed up a hashtag? Fix it. Misspelled Mississippi? Fix it too. Why this feature has taken so long to be included is beyond me, but we are happy to see it arrive. 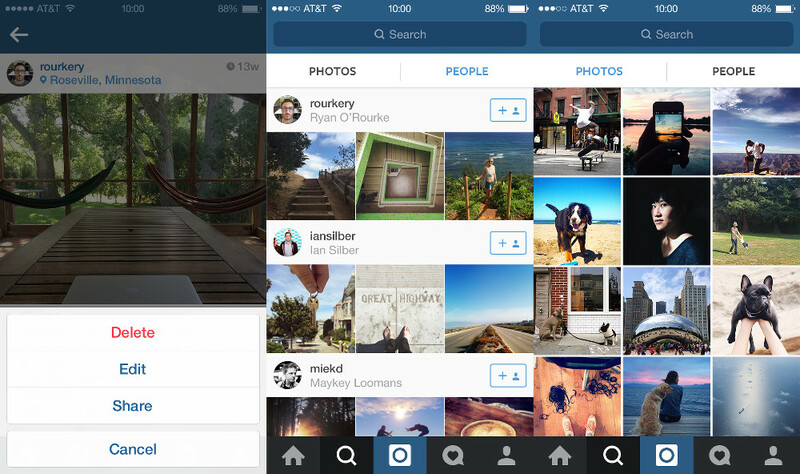 As for new discovery options, Instagram is giving you two choices in the Discovery tab. Well, first of all, they changed the Discovery icon to a magnifying glass, to help you identify new people with searching (or something like that). Once in the Discovery tab, you will now see Photos and People panels to choose from. The Photos panel is the familiar Discovery page you have always used, but the People tab tries to highlight interesting accounts for you to discover. The update should be live later today.